Third party analysis indicated that these CT string failures manifested in the form of pinholes and corrosion, primarily at the bias weld. The filler material used in bias welds has different mechanical properties than the base pipe material, making it weaker and more prone to fatigue. To determine the mechanism of failure, CT string and fluid samples from four of the seven units were further analyzed. This analysis revealed internal corrosion pitting in both the base and filler material and extremely high concentrations of bacteria in the source water (>107). The presence of both sulfate reducing bacteria (SRB) and acid producing bacteria (APB) was indicated in the fluid and on the solid metal using the OSP LifeCheck™ SRB Indicator Kit and LifeCheck PRD Kit, respectively. These bacterial subtypes are known to be related to microbial influenced corrosion (MIC). MIC is caused by the formation of biofilms resulting in localized pitting corrosion, which leads to micro-cracks and eventual pipe failure. The CT service company undertook laboratory and field studies to evaluate available biocides with the goal of creating an optimized treatment program. Multiple field water samples were subjected to biocide kill and loading studies to determine efficacy and optimal concentrations. Field studies were then performed to confirm the laboratory results and establish the treatment regime as well as the bacterial contribution from source fluid versus wellbore flowback. Bacterial levels were monitored using the OSP LifeCheck ATP Test Kit, which measures the metabolic activity of living cells through quantification of ATP (adenosine triphosphate) levels in fluid. Four biocides were evaluated: glutaraldehyde, 2,2-dibromo-3-nitrilopropionamide (DBNPA), tetrakis(hydroxymethyl) phosphonium sulfate (THPS) and OSP 2K7®. Because each compound has a different mode of action, biocides were tested at the same concentration. Once comparative efficacy was evaluated, optimal treatment level was determined. The laboratory analysis showed that while all biocides were initially effective at reducing bacterial levels, the glutaraldehyde and THPS effects were short-lived with levels rebounding after one day. The 2K7 and DBNPA biocides were further evaluated over a range of ppm values. Even at the highest concentration tested, the DBNPA showed bacterial population recovery at 2 weeks, with lower concentrations rebounding in less than a week. 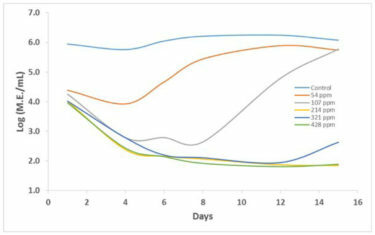 The 2K7 biocide was effective at 100 ppm for 8 days – twice as long as the DBNPA at the same concentration – and at >200 ppm reduced bacterial levels for 2 weeks. 2K7 biocide works by disrupting the activity of bacterial membrane proteins causing cellular collapse. Unlike other biocides, which can react with friction reducers negating the effect of both, 2K7 is nonionic and does not react with other fluid additives. Field studies conducted on three separate well pads showed that one 2K7 Water Soluble Pak (WSP) per 10 m3 (63 bbl) surface water effectively reduced bacterial levels from >106 to<104 with agitation of the fluid reducing the reaction time. This fluid was then used for CT bridge plug milling operations and bacteria levels monitored at various fluid locations in the closed loop throughout the operations. Evaluation of flowback from the wellbore indicated consistently lower bacterial concentrations than the injected surface water. Despite this, bacteria levels at surface were rebounding. Therefore, the observed increases in surface bacteria were due to the population rebounding while sitting in the surface tanks. This rebound effect was because the CT fluid for the mill-out operations was reused for each successive pad well. As flowback water was introduced into the surface tanks, so were the additives (polymers, surfactants) from stimulation operations that, along with dissolved formation nutrients (sulfates, nitrates, phosphates) and increased temperatures, provided an ideal environment for bacterial regrowth. The ability to identify the source of bacterial population rebound in real-time using the OSP LifeCheck ATP Test Kit enabled implementation of lower, maintenance treatments of the surface water with 2K7 biocide (one WSP per 40 – 100 m3 fluid every 12 – 24 hr). In addition, pre-storage treatment of the CT unit has been implemented as the standard operating procedure by the CT service company. Since the treatment program, no additional CT string failures associated with MIC have been recorded.